Living in the land of Treat is wonderful. There's cakes, chocolate and ice cream in abundance. Unfortunately getting around isn't all that easy. Sometimes the only way is to switch to the Trick dimension where ghosts, skeletons, witches and other evil characters are out to get you. Can you switch between dimensions to find all the items in this platform game that combines exploration and puzzle solving? 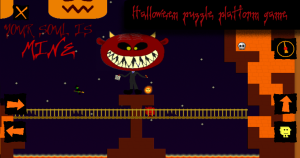 Get your spook on when trying to make your through this free puzzle platform game. You won't be able to get all of the goodies in the land of the Treat without venturing into the scary Trick world, which is full of monsters and other dangers. Can you find the route to each item and the portal home? I am pleased to announce that the Halloween puzzle-platform game “Trick or Treat” is the first Oxygen Addict game to be released on Linux! Explore more of spooky worlds and collect more goodies in this great new update for Trick or Treat. I am pleased to announce that my first Windows Phone 8 game is now available on the Windows Phone Marketplace. Get your spook on this October with the Invertical spin off, available on PC and Android. Trick or Treat is now available for Ubuntu. Instructions within the Readme.